Danigral - 1 out of 5. Just like the Hunters, this attachment suffers (more so than the fact that it’s an attachment) from the fact that it only does anything when the character is at a story. Perhaps if you put it on an Obsessive Detective, it might gain more traction, but that seems like too much work. mnbroncos - 2 out of 5. 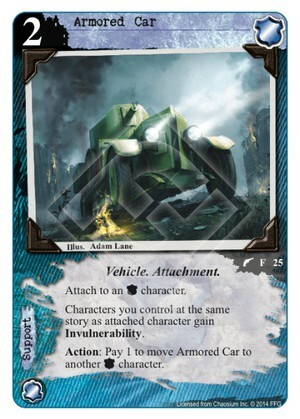 I really like this card but to me the only downside really is that the character that has the armored car only has invulnerability while at a story, and with Khopesh as popular as it is right now to easy to be 2 for 1. However, this card is a three if on an invulnerability character. I also really wish it was a disrupt to move the car to help move it around when attached character is removed. Obtuse - 1 out of 5. I’m with mnBroncos in that I wish the Action were a Disrupt. Uhm...pair this with Dynamite and Flush them Out? I’m trying too hard there, I know. livingend - 1 out of 5. Attachments that go on characters have to really deliver in order to be any good and invulnerability certainly doesn’t qualify as such a delivery in the combat-heaviest faction of the game. Now, if you could attach this to Claret Knight or Savio Corvi, that’d be a completely different story. But alas, we’re stuck with this. Verdict: Binder fodder. WWDrakey & Ire - 2 out of 5. Honestly, one of those points might be for art and theme. Now, all we’d need is a proper tank to fill out the incredibly janky and uncompetitive ‘Cars R Us’ deck. Database typo note: card's action text in db mentions "Armored card" where is needs to say "Armored Car". I'm not a fan for a few reasons. For one, it can only be attached to an Agency character. Second, there are plenty of ways to wound characters besides just killing them with combat struggles. Basically, your guys only jump in the car when they're anticipating a fight. For most of the game, they're not in the car. Third, it inherently comes with the Attachment card disadvantage that everyone talks about, so something as simple as going insane can cause you to lose the car without a chance to save it. Nah, I'll pass on this one. This card also gives Invulnerability to the character that has attached it? Right? I would think so. The wording feels a little odd, but if you commit the guy this is attached to, he would seem to get invulnerability as much as anyone else you commit to that story. I wonder if it might be fun, to attach this to an opposing character. The wording is a bit clunky, but yes, the character that the Armored Car is attached to is also a character at the story and would gain invulnerability. It would say "other characters committed to the story" if the intention was to omit the attached character. Er, twisted. The card text seems to allow for it.